A cylinder with a radius of 3 units and a height of 5 units has a volume of 141.372 cubed units. 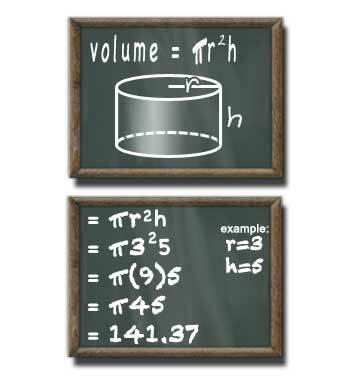 In plain english the volume of a cylinder can be calculated by squaring the radius, multiplying that value by PI, then multiplying by the height. You can also think of it as finding the area of a flat circle (PI * radius squared) and multiplying by the height to find volume. Here is a step-by-step case that illustrates how to find the volume of a cylinder with a radius of 3 inches and a height of 5 inches. In this example PI will be 3.14.